Bacon cured to our standards of our legendary ham. Schaller & Weber Black Forest Bacon came from years of charcuterie experience. By smoking this fine bacon to the standards of our Black Forest Ham we’ve created a style as versatile as it is delicious. Each brined slab is cured and the bones are hand-pulled leaving the savory and slight sweet rib meat. It’s waiting to be chopped and dropped in lentil or pea soup, or sliced and served with sauerkraut or on a sandwich. 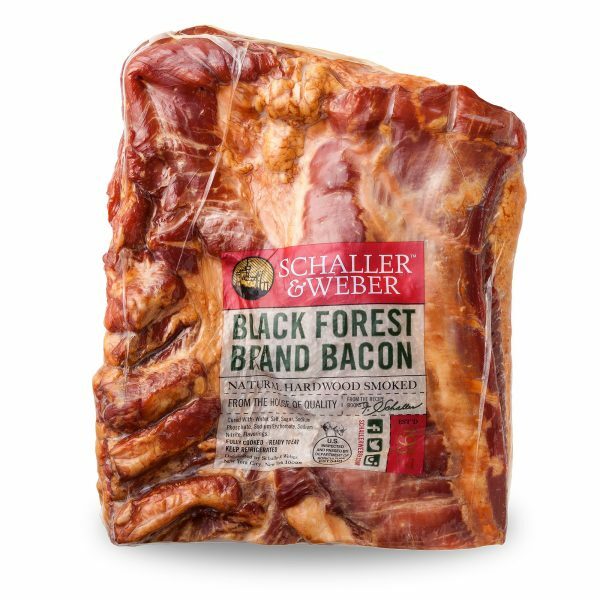 Schaller & Weber Black Forest Bacon comes fully cooked and uncut. Food Service ready. Vacuum sealed in 4-pound packages.